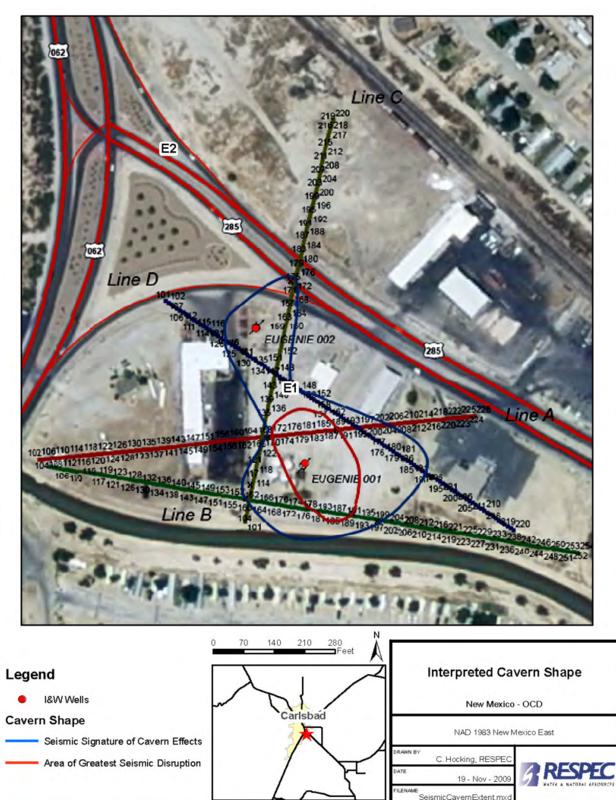 Image from seismic evaluation report to the NM Oil Conservation District. A TV ad criticizing Gov. Susana Martinez on an environmental issue is airing in the next two weeks, sponsored by ProgressNow New Mexico. The progressive nonprofit is airing the ad on Albuquerque TV and cable stations starting today. A New Mexico In Depth analysis of Federal Communications Commission contracts indicates the group has reserved more than $94,000 in airtime. While the current ad is scheduled to run for two weeks, the group also has time scheduled in September. Martinez backed a bill during the 2016 legislative session that would have funded a study to prevent a potential sinkhole from an abandoned brine well near Carlsbad. The company that owned the brine well went bankrupt, but its former owners and their family members donated nearly $20,000 to the governor’s 2010 and 2014 campaigns, the Santa Fe New Mexican reported earlier this year. Lowell Irby and his sons, Eugene and Kirk, have donated more than $30,000 to New Mexico candidates, mostly Republicans, since 2010. Of that, Martinez received $19,750 and her Susana PAC received $1,000. Lowell and Eugene were officers of the mining company. After the New Mexican story, two bills to fund the $150,000 study died in the Legislature. The work needed to prevent the sinkhole is estimated to cost up to $25 million. While the ad insinuates Martinez asked the Legislature to fund the cleanup, neither bill asked for $25 million. The initial ad in the “Put New Mexico First” campaign states that Martinez “personally asked legislators to pick up the tab to clean up their mess,” referring to the company. The ad then notes company officials’ campaign contributions to Martinez. The campaign is aimed at getting New Mexicans to make the connection between money in politics and policy decisions, said ProgressNow New Mexico Executive Director Pat Davis. The campaign is focused on the environment because “this is something that New Mexicans universally support,” he said. Similar ads will air on radio and online, with future ads planned based on response to the initial offering, Davis said. The ad drew heat on Twitter from Advance New Mexico Now, a super political action committee affiliated with Martinez. New Mexico In Depth is awaiting response to a request that someone from Advance New Mexico Now call to discuss the ad campaign. Davis noted that the ad doesn’t have a political message, so no disclosure of its funding is required.